The destination of the ice dance gold was decided in the short dance where all the teams, except Kaitlyn Weaver and Andrew Poje, made mistakes. The World silver medallists had a six point lead over their nearest rivals going into the free dance and nothing barring a disaster was going to stop them from winning in Barcelona from that point on. There was no fall in their “Four Seasons” selection of music and none in their routine either and the Canadians posted a spectacular new personal best of 109.80 to claim their first ever Grand Prix Final medal and title. There had been some momentum behind Madison Chock and Evan Bates going into the Grand Prix Final, but that was disrupted when Bates tripped up in the short dance putting himself and his partner with too much ground to make up in the free. 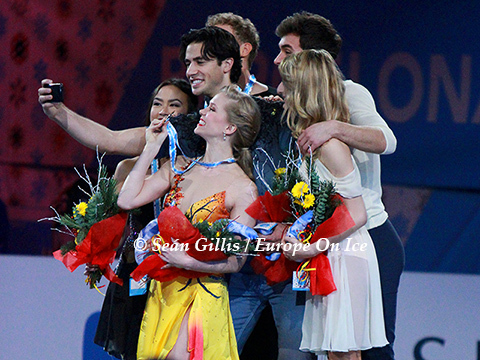 Their “An American in Paris” programme did not score as highly for the Americans in Barcelona as it did at Rostelecom Cup last month, but it did help them also to secure second place and their first Grand Prix Final medal. “We were really happy to finish the competition the way we did,” Chock said looking back on the event as a whole. 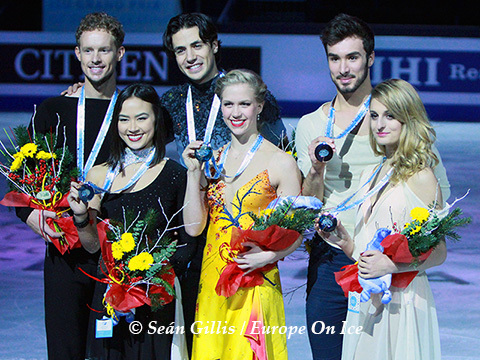 Once in a while in ice dance, a team comes out of nowhere to break into the upper echelons of the sport. Gabriella Papadakis and Guillaume Cizeron have been this year’s new find after consummately winning both of their Grand Prix assignments. The growing expectation on their young shoulders showed in the short where Papadakis wobbled on the twizzle sequence which pushed them down to fifth. Their Mozart free has been breathtaking all season so far and it was no different this time around. All of the elements fitted seamlessly together and every single nuance of the music was captured. Such was the beauty of the piece that even some members of the accredited media at the competition found themselves moved to tears by it all. The French moved up to third overall and you just know that this is only the start for this magical combination. The pairs competition was a straight-up showdown between Canada and Russia for the top prize. Meagan Duhamel and Eric Radford got the upper hand in the short largely due to their inclusion of side by side triple lutzes in their routine. The very same element caused them issues in the free skating, but their quadruple salchow throw came up which helped propel them to new personal bests in all segments and Canada’s first pairs title at the Grand Prix Final since 2001.This was also the first time that any Canadian team had stood on the podium since that year. Ksenia Stolbova and Fedor Klimov skated very well to finish second, but did not have the technical arsenal to match Duhamel and Radford. The Olympic silver medallists had only one slight glitch on a triple toe loop/double toe loop/double toe loop combination in the free when Stolbova singled the second double toe loop. The Russians did their best to get the audience on their side with a Spanish version of “Notre Dame de Paris” for their free skating music (they had previously skated to English and French versions), but had to settle for silver in the end. There were three couples from that other pairs superpower, China, in the event and Wenjing Sui and Cong Han emerged as the top-ranked of the trio in a closely fought contest for the bronze. “We didn’t show our best in this competition, but we could get this placement so we feel lucky,” Han said. The Junior Grand Prix Final ran concurrently to the senior event and we had a glimpse at the future of the sport. Evgenia Medvedeva won the fifth ladies title in a row for Russia and Anna Yanovskaya and Sergey Mozgov claimed their second gold at this event on the trot and the sixth consecutive one for Russia in ice dance. Canadian junior pairs team Julianne Seguin and Charlie Bilodeau matched the feat of teammates Duhamel and Radford, while Shoma Uno did likewise in the men’s event. Uno’s total score bested that of both Takahito Mura and Tatsuki Machida in the senior final suggesting that his time may come a lot sooner than anyone expects. Prior to the event there was a lot of excitement about taking such a big competition to a new skating country and there was a little bit of anxiety about whether the attendance and organisation would be up to scratch. In the end, it was a phenomenal three days of competition with very enthusiastic and supportive crowds and the event proceeded like clockwork. We have a feeling it won’t be too long before another major skating event comes to Spain.